I've been thinking about giving the weekly forecasts some new life for a while. 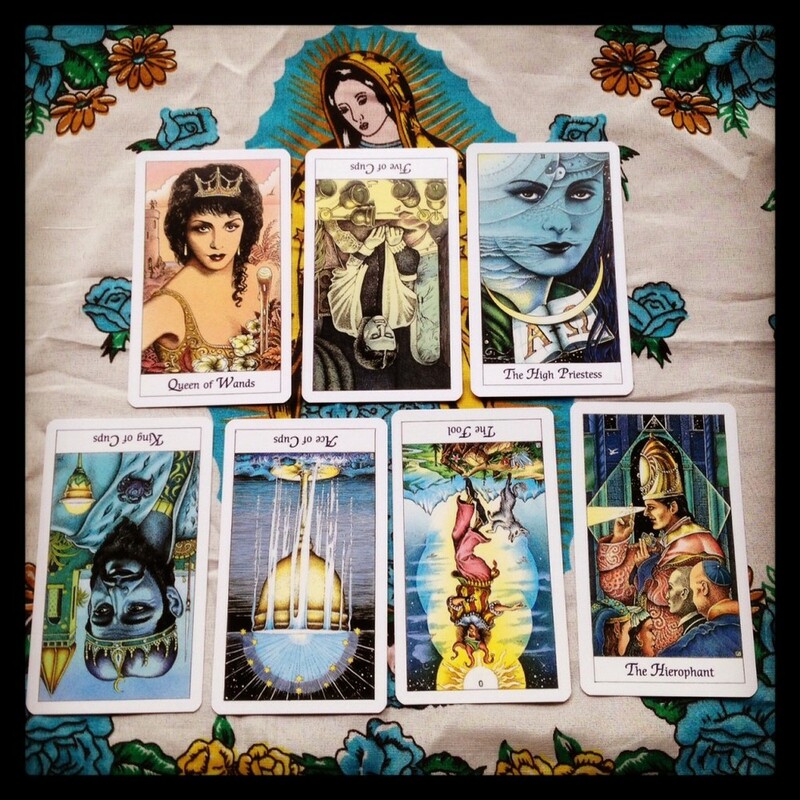 People seem to be resonating with my one card readings but from looking at other awesome Tarot blogs everyone seems to be doing three card readings. So I was like - hey God, Guides and Angels, what should I do for my weekly reading? Should I pull three cards? Should I copy Doreen Virtue's weekly readings style? Or do something more like what Kyle Gray is doing on his YouTube channel? What should I do?! And I heard this voice in my head say SEVEN. I was like - "OMG are you kidding me? SEVEN cards?" and then I heard nothing so I thought OK, fine, you win. I'll do SEVEN! So here it is, the first seven day seven card reading from New Age Hipster! Yikes! OK, this is a positive start to the week. This Queen reminds me of some kind of Fairy Queen. She's very sweet and loving and kind to animals, but if you piss her off - WOAH watch out! She's reminding you today to channel your inner Fairy Queen. Don't take crap from anyone today. Stand in your power and know that you are good enough to follow your dreams OK?! Something might not go to plan today. You might mess something up, miss the bus, spill your morning coffee or after work drink on that hottie patottie from finance, or you might just be generally feeling drained. What can you do about it? Drink more water. Eat well, look after you today. Really put in some self care stuff. Don't beat yourself up because you're not perfect. No one is, not even Beyonce. Yay! Today we are getting intuitive hits like BOOYAH! It's a great day to spend some time doing whatever Spirit-Junkie, New Age Hipster, Spiritual thing you like doing that works for you. Pull some cards, do some journalling, talk to your Angels in the shower. You are extra intuitive today so use that to your advantage to get some answers you've been seeking. This is a guy who's been driving you a little nuts. There's some jerk energy around you today - someone at work, someone looking for a rise out of you on social media or some guy in a big car cutting you off in traffic because you're nothing but a girl who can't drive. Today be extra grounded and protected. Imagine yourself in a bubble of light today (and everyday!) and ask Archangel Michael if you can borrow his shield, he'll totally let you. You might want to stack yourself up with some protective crystals too. On these days I put an Obsidian in my bra. Dudes you probably have pockets. By Friday you might feel a little emotionally wrecked, exhausted or just a little out of sorts - but cheer up poppet! It's FRIDAY! Whoop!Chill out tonight - watch a rom com with your better half, or alone, or with a cat. Eat popcorn, drink wine, meet up with that guy from finance for drinks if you feel up to it, or just hang out with some best buds. It's not the best night to be going on the pull. Seriously, you'll never meet anyone worthy of you doing that anyway. Have some you-time to recharge those batteries! Seriously, what's with all these reversed cards?! OMG. OK today you aren't taking any huge leaps of faith, but maybe it's time to start planning a leap of faith. What are those projects you've been putting off? Are you halfway through an online course that you just haven't been participating in (hello this is so me, I have like 5 courses I'm currently doing, don't do that - don't enroll in so many things! ), do you want to start your own blog, or business, or find a new job or career path? What's the big jump you want to take? Spend some time today thinking about that and making plans, even if it's just in your head while you browse Pinterest. Better yet, make a Pinterest board about your dreams, business, whatever! How appropriate for a Sunday! This is the card of traditional lifestyles and expectations, and that's so Sunday. Spend time with your fam, do some housework, get the laundry done, go out for a civilized lunch or just chill on the couch. It's a happy homes Sunday and a roast with the loved ones would probably be perfect today. Enjoy the simple things in life today - write a gratitude list and wear warm fuzzy slippers.